Son of Aquilla and Florence Barber; and stepson of Lena M. Barber, of Simcoe, Ontario. 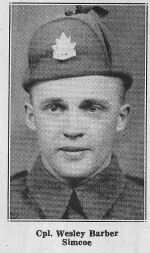 His brother, Private Arthur Oliver Barber, served in the same unit, died on the same day and is buried elsewhere in the Dieppe Canadian War Cemetery at grave reference K. 30. Commemorated on Page 56 of the Second World War Book of Remembrance.